Vineet’s Thorax paper was published today and has started gaining some traction. 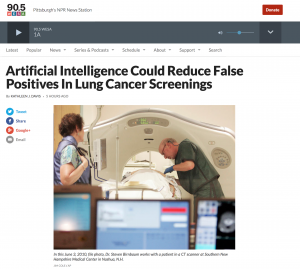 Co-senior author, David Wilson, was interviewed by our local NPR news station; and this was the first of the references of the publication in the press, which included US News, Science Daily, Health IT Analytics and others. In this study we used probabilistic graphical models to develop a predictor of cancer status in indeterminate lung nodules detected through low-dose CT scans. Low-dose CT scans are routinely used for early detection of lung cancer and have helped reduce mortality. However, 96% of the detected nodules are benign and currently people have to subject themselves to additional screening that increase the anxiety and costs. Our model can potentially reduce subsequent screenings to 28% of people with benign nodules without risking cancer misclassification. Congratulations to Vineet and the team that completed this study.